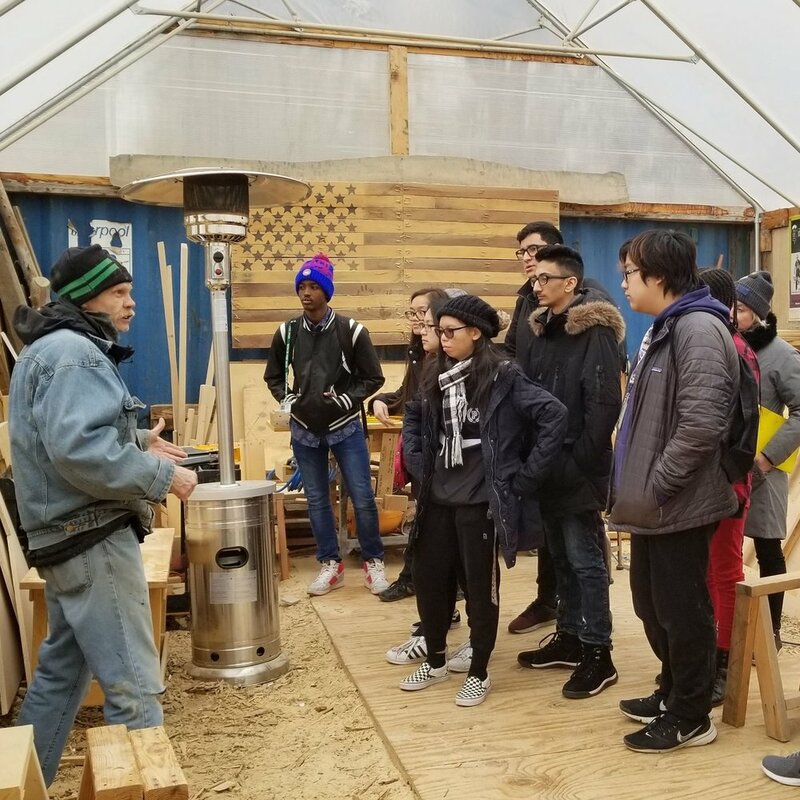 On February 28, 2019, 12 students from Senn High School visited The Commons looking for inspiration as they worked on Design4Democracy, a project supported by the Chicago Learning Exchange. The project engaged teens in a collaboration with Convergence Design Labs to redesign their school’s library into a “student-owned civic media space.” During their visit, the students were exposed to the artistic and creative aspects of The Commons and left with inspiration to implement into their project. Read on to learn more about their visit. As is the routine with all curated experiences at The Commons, the visit began with introductions - to people and to the space. Each person had an opportunity to share their background - the SWF Team introduced themselves and their roles at SWF, and the students shared their interests, where they came from, and information about the library project. The students were familiar with design tools, such as Sketchup, and many also shared they had not been exposed to the process of building. SWF Apprentices have an opportunity to see a process from start to finish: Idea → Sketch → Drawing → Rendering → Implementation → Realization. The students did not have time to build during their visit but expressed interest in returning to build and grow. After introductions, the group went on a tour of The Commons- taking pictures and jotting down notes along the way. They were amazed by each space: the Library, the Maker Space, the Work-Shop, and the Thought Barn. In the Maker Space, they had an opportunity to see Michelle Nordmeyer, SWF Human-In-Residence, lead a printmaking workshop. In the Work-Shop, they were exposed to the process of building a fractal. In the Thought Barn, one of the students gave a breakdancing performance on the hexagonal dance floors. Throughout the tour, the group was exposed to the flow at The Commons that encourages creativity, flexibility, learning, and exploration. Throughout the semester, the students have been working in three teams: The Learning Space, The Creative Project Space, and The Hangout Space. Each team is responsible for redesigning the space so that the school’s library works best for the entire student body. After the tour of The Commons, they broke up into their teams to reflect on their tour and brainstorm ways they can incorporate the inspiration they gained into their respective spaces. For example, The Learning Space team was inspired by the chalkboard and dry erase board paint on the walls of the Think-Do House. They discussed the possibility of painting the walls of their section for students to use while studying. The Hangout Space team wanted to incorporate SWF’s Geometric Shape wall hangings in the space as shelves to hold games and decorations. Each team was also inspired by SWF’s Fractals. Time and time again, fractals have been used in a variety of creative ways. In a library setting, fractals can be used as bookshelves, seating, or for school supply storage. The entire SWF team enjoyed the visit from the Design4Democracy students and looks forward to staying connected.